A few days ago, during my quiet time, I came across this verse that jumped out at me. "I have much to write to you, but I do not want to use paper and ink. Instead, I hope to visit you and talk with you face to face, so that our joy may be complete." The apostle John was writing to believers. He has some important things to share with them. So important, that he decides to wait and talk about it face-to-face. This is a reminder that as Christian leaders, we must discern when a face-to-face conversation is needed. There are some things that shouldn't be communicated by email, text or even over the phone. They require a face-to-face conversation. How you say things is just as important as what you say. That's why it's important to say the following things face-to-face. The person or people you are talking with need to be able to look into your eyes, read your facial expressions and feel the tone of your voice. These things get lost in translation when you don't talk face-to-face. Don't give in to the temptation of taking a short-cut. Sure...the easy thing is to send an email or text message. Especially if it's a tense situation or emotions are starting to get involved. But that's even more reason why you need to be close and personal with the person. The Bible emphasizes this in Matthew 18 when it says we should "go to the person." Person-to-person may not be the quickest way, but it is the best way. 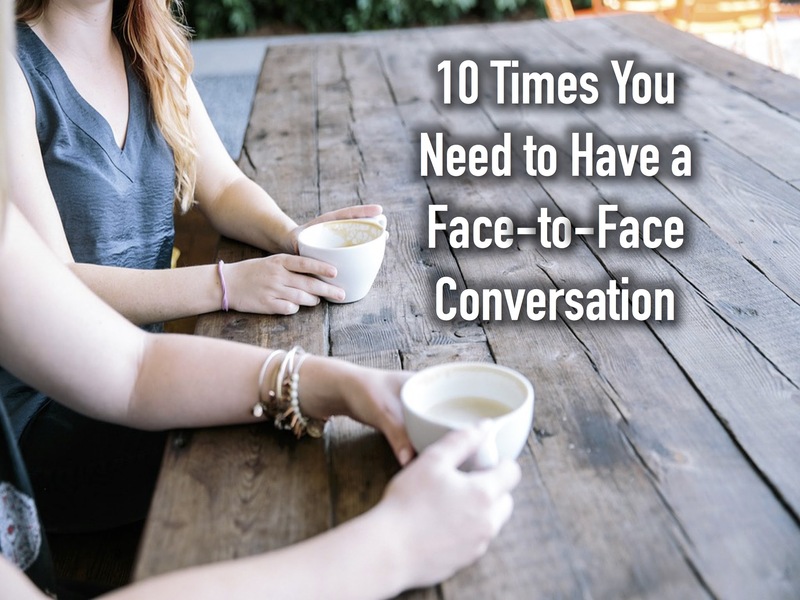 Let's look at 10 times when you need to have a face-to-face conversation. 1. A parent or volunteer contacts you with a complaint. When a parent or volunteer calls or emails with a complaint or issue, you should tell them you'd like to talk with them face-to-face if possible. Unless it's an emergency, giving them a few days to calm down before you meet usually helps deescalate the situation. Even if they unload on you on the phone before you can get a word in, hear them out and then ask if you can meet in person to talk about it. 2. You are bringing someone on your volunteer team. When you are bringing a new volunteer on your team, you should sit down with the person and have a face-to-face meeting. You need to be able to look them in the eye, hear their story, find out what their passion is, etc. This is in addition to having them fill out an application and running a background check. When you take time to meet with potential volunteers in person, it communicates the value and importance of serving on your team. 3. Your direct report does something you don't understand or have an issue with. There will be times when the person you report to does or says something that you don't understand or don't agree with. Don't talk to other people about it. Don't hold it inside and get bitter about it. Go directly to the person and with a humble spirit, share your concerns or how you were offended. Let the person know you have not talked with anyone else about this, but came straight to him or her. Your direct report will respect you for this and together you can work out the issue or misunderstanding. A simple rule to remember is this - Don't talk sideways. Always talk up...face-to-face. 4. You have to confront someone about a sin or transgression. You find out a volunteer is involved in sin or questionable activity. Or perhaps a person on the team is causing disunity or is not living out the core values. You know you have to talk with the person about it, but you are dreading it. Most of us are not naturally good at confrontation and our first response is to run from it. But again, Matthew 18 tells us what to do. It must to be face-to-face. 5. When you are apologizing. There will be times when you offend someone. There will be times when you make a mistake. There will be times when you forget something that you promised you'd do. There will be times when you let someone down. And you know you should apologize. Apologize in person. It will add more depth and sincerity to your apology. 6. When you are giving someone feedback. As a leader, part of our job is to help our team members grow and develop. A big way you do this is by asking permission to give constructive feedback (there's a big difference between that and criticism). The feedback should always be given face-to-face. When you give it in person, it increases the impact and helpfulness. 7. When you want to express your appreciation at a high level. Thank you notes are great. A quick text to say thanks is nice. But when you really want to thank someone in a big way, say it face-to-face. Let them sense your appreciation and feel in the tone of your voice how much you value them. 8. When you have to deliver tough news. There will be times when you are asked to deliver heartbreaking news. The death of a volunteer's family member. Someone being asked to step down from their position. A cancer diagnosis. The changing of a program that a key volunteer helped start years ago and holds dear. If at all possible, these type of things should be communicated in person. You want to be there to comfort the person and pray with the person. You can't put your arm around someone over the phone. 9. When you want to share a vision or important initiative. You have a new program you want to start. You want to ask for an increase in your ministry budget. You want to switch to a new curriculum. You have a dream for remodeling your facilities. You want to make the ask for an additional staff member. Put your plan in writing. Get the details on paper so you can show the steps you'll take to make it happen. Put together the budget and have your numbers ready to share. But...don't send it to your Pastor or elder board or direct report in an email. Set up a meeting where you can share it with them face-to-face. They need to see the passion in your face. They need to feel your heartbeat as you share what God has placed in our heart. 10. When someone asks for counseling. When parents ask for parenting help. When a volunteer who is struggling asks if he can talk with you. When a student volunteer is being bullied at school and wants to talk about it. When a couple is having marital trouble and asks if they can meet with you. Talk to them in person. When people know you care enough to meet with them in person, it will open their heart to your spiritual advice. As I was writing out this list, it brought back memories of times early on in ministry when I took the easy way out and hid behind a keyboard rather than doing the hard work of meeting face-to-face. In each instance, it cost me relationally and personally. I had to learn the hard way, the importance of knowing when to talk with people in person. Even after years in ministry, there is still the temptation to substitute face-to-face meetings with a text, email or phone conversation. I must be intentional about communicating properly. I have a feeling I'm not alone. I think we all struggle with this at times. Especially in today's culture of high-speed communication. But I hope we'll remember the next time we’re tempted to fire off a quick email in a moment of anger, or frustration or busyness, to stop and ask ourselves what the best way to communicate is in that situation. Face-to-face conversations can make a big difference in the quality of your leadership, the depth of the relationships you build, the impact you have and the effectiveness of your communication. "Instead, I hope to visit you and talk with you face to face, so that our joy may be complete..."
Face-to-face communication leads to a more joyous, complete ending. Don't settle for anything less. Your turn. The floor is yours. What are some other situations where you should always use face-to-face communication? What are some other things you've learned about this? What tips do you have about talking with people face-to-face? Share your thoughts and insight with us in the comment section below. This is a great post, Dale. I have found myself in every single situation as a Children's Minister. I noticed after a while that these face to face conversations were also opportunities to make disciples as Jesus taught us to do. I also learned that the times it was hard for me to make these face to face meetings happen were often because I had my priorities out of place - I needed to remember that ministry is about people first, projects second. Thank you Marcie. Great insight about it being an opportunity to make disciples and making people interruptions a priority.